Natural gas cautiously rose to $2.317 to fulfill the smaller than (0.618) projection for the wave $2.188 – 2.336 – 2.231. Typically, a move to $2.38 would now be expected because waves that meet the 0.618 projection normally extend to at least the equal to (1.00) projection. 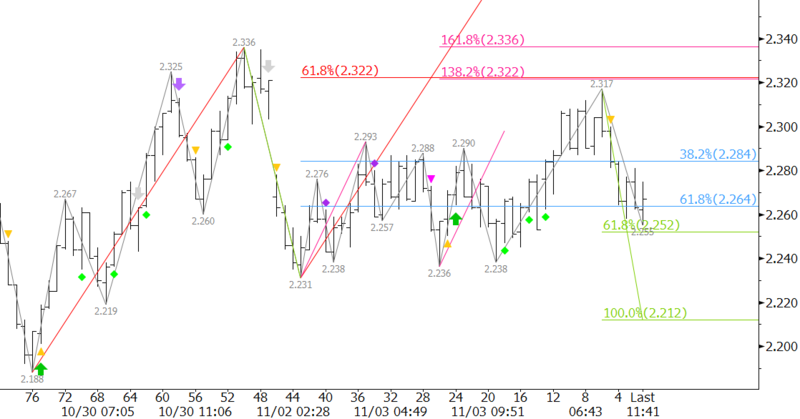 The pullback to $2.255 is a bit worrisome, but until the $2.231 swing low is taken out odds favor of a move to $2.38. This is a crucial target because $2.38 is the 38 percent retracement from $2.78 to $2.188 and makes a connection to $2.48 where last week’s gap would be filled. KaseX warned that the decline from $2.317 would extend (yellow triangle), and as stated, support at $2.25 is already being challenged. A move below $2.231 would take out the wave up from $2.188 and its projections to $2.38 and higher. This would in turn shift odds back in favor of a decline to $2.11 to fulfill the requirements of the textbook five wave pattern down from $3.391 as discussed last week. This is a brief natural gas forecast ahead of tomorrow’s EIA report. Our weekly Natural Gas Commentary is a much more detailed and thorough analysis. If you are interested in learning more, please sign up for a complimentary four week trial. Next Next post: Is the “Baby’s” Sugar High Over?